With the game tied at 5-5 heading into the bottom of the eighth inning, the Rams exploded for five runs to build a commanding lead. The Rams (29-21) came through with a 10-6 victory Thursday afternoon over the Golden Eagles (30-21) in the first round of the MEC tournament in Beckley, West Virginia. Early on, things were not looking well for the Rams, as senior starting pitcher John Bentley gave up two first inning runs. Outfielder Austin Hathaway began the scoring in the top of the first inning with his solo-shot homerun to center field to provide the Golden Eagles with a 1-0 lead. A double by catcher Steven Davis made the lead 2-0, as shortstop Lee Carneal came in to score. After a RBI single by junior infielder/outfielder Chase Hoffman in the bottom of the first inning that cut the Golden Eagles’ lead to 2-1, the Rams’ really came to life offensively over the next few innings. Freshman outfielder Brenton Doyle tied the game with his homerun to left field in the bottom of the third inning to tie the game at 2-2. Another solo-shot by redshirt-junior infielder/outfielder Daniel Heleine in the bottom of the fourth inning gave the Rams their first lead of the day, as they now lead 3-2. Doyle would step to the plate later in the inning and deliver a RBI single up the middle to bring in junior infielder/catcher Dalton Haymaker to increase the lead to 4-2. Clearly, Doyle was on his game, as the Golden Eagles appeared to not have a solution to stop him. 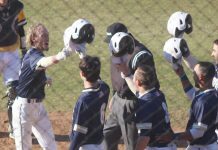 However, all the momentum the Rams had built dissipated when the Golden Eagles scored two runs in the top of the fifth inning to tie the game again at 4-4. Outfielder Colby Johnson tripled to right center field, earning a RBI, as second baseman Ehtan Hunt scored on the play. First baseman Gianfranco Morello brought Johnson home to tie the game at 4-4 by grounding out to first base unassisted. Morello was credited with a RBI in the action. Following a homerun by senior outfielder Ron Farley in the bottom of the fifth inning to give the Rams a 5-4 lead, Hunt again tied the game for the Golden Eagles in the top of the sixth inning. Hunt sent a sacrifice fly RBI to left field to bring home third baseman Taylor Itnyre, tying the game at 5-5. 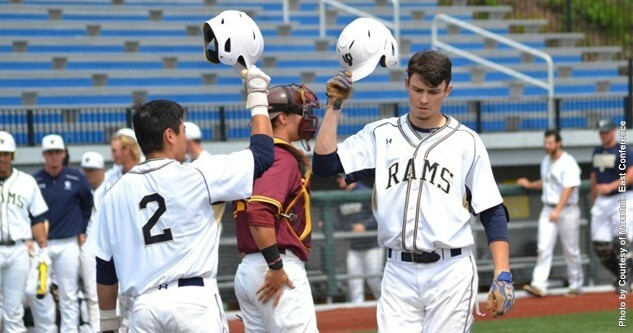 If reading this article is not clear enough, the Rams and Golden Eagles both displayed tremendous difficulty in keeping the lead, as both offenses continued to battle and push the pitchers on each side. 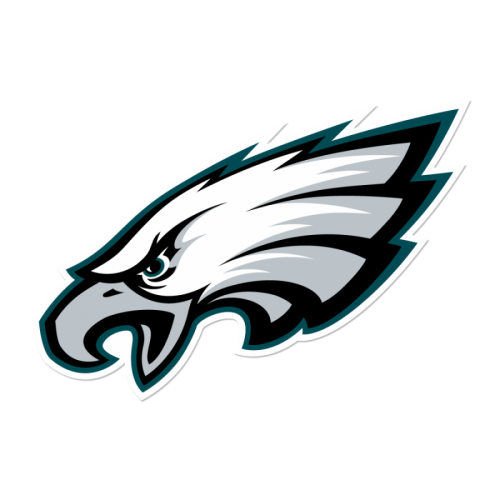 This theme would not continue for the whole game, however, as the Rams’ offense put the game away for good in the bottom of the eighth inning with a clutch five-run performance. Senior infielder Jacob Carney drove home fellow senior infielder Brandon Kirk with his RBI single through the left side that gave the Rams a 6-5 lead. Doyle, as he had done all game long, delivered another blow to the Golden Eagles with his sacrifice fly to right field that provided enough time for freshman infielder Trenton Burgreen to come in and score. This increased the Rams’ lead to 7-5, but based on how the game was going, it did not feel safe enough of a lead. Farley cleared any doubts of another blown lead with his heart-smashing triple with the bases loaded that brought home three Rams’ runners, including Hoffman, senior outfielder JJ Sarty, and Carney, to augment the Rams’ lead to 10-5. While Hathaway homered to right field in the top of the ninth inning, it would not be enough, as the Rams held on for 10-6 victory. Bentley (6.0 IP, 10 H, 5 R, 5 ER, 0 BB, 5 SO) struggled to hold the lead against the Golden Eagles, but sophomore relief pitcher Ryan Potts (W, 2-1) was able to control the Golden Eagles’ offense for the most part in his three innings of work. Potts, in the winning effort, came in for Bentley and allowed three hits, one earned run, walked one, and struck out three in his three-inning gem. Robert Fultineer (L, 1-6) entered the game in the sixth inning for the Golden Eagles with the game tied at 5-5, but did not have his best relief appearance. In his three innings of work, Fultineer surrendered five hits, five earned runs, walked none, and struck out three. 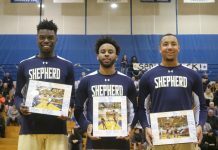 The level of offensive efficiency the Rams showcased certainly gives them reason to be encouraged going forward in the MEC tournament. With Mother Nature getting in the way on Friday, the Rams will have to wait to face West Liberty until 9:30 a.m. Saturday morning in the second round of the MEC tournament. 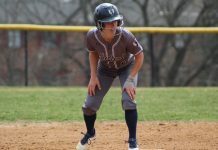 Previous articleShepherd Softball takes down UVa-Wise in NCAA Division II Atlantic Regional action.